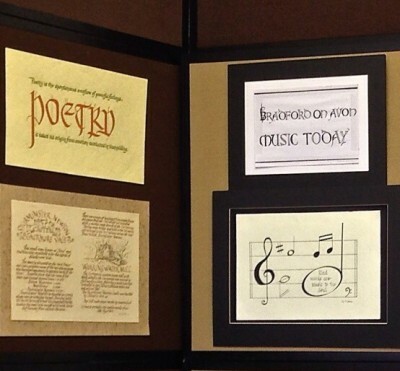 The Calligraphy group commenced in October 2011. Today we have three very committed calligraphers that meet about once a fortnight at the Leaders home in Bradford on Avon – time and day agreed by the group. Two of the group exhibited their work at the exhibition to celebrate U3A in St James Hall in 2012. Our aim is to capture the mood and the spirit of the text/quote or create a card for their family and friends. As leader, it is so rewarding to see the groups inspirational ideas in the presentation combining calligraphy and illustration.